Apologies for the minor delay and greetings to the new readers (seriously, there are a lot of you). I had planned to finally get to a chocolate bar that has been patiently waiting for me on its shelf, but it will have to wait until next time. 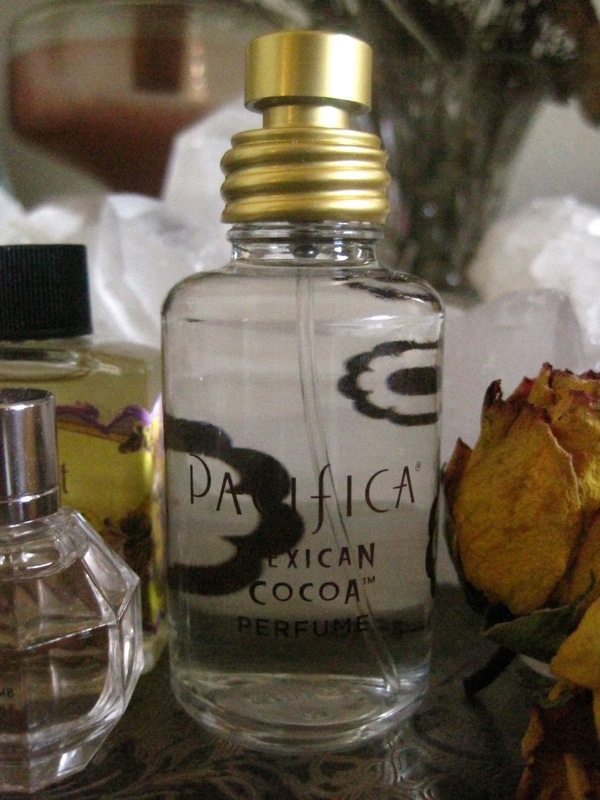 For now, let's return to Pacifica's Mexican Cocoa Perfume. You will recall that I put this perfume in my July Favorites; it has, then, taken me over three months to finally go over it in more detail. The problem, and my overall opinion of this perfume, is that I like the idea of a cocoa perfume more than I like the delivery. Pacifica Perfume is a U.S. company, and this product is in fact made in the U.S. That alone is probably reason enough for the little, non-chain shop I bought it in to stock Pacifica. However, I could do with some improvements on it all. The box is alright: rich brown and red form indie, gypsy shapes to give an offbeat, hip vibe. But the bottle is plain. Not only is its shape basic, but the top piece (what would you call that?) is boring. It sounds more interesting if you say it has an industrial look, like an exposed lightbulb. But, honestly, I'm not overly thrilled about how this bottle looks next to my others. The lettering and the three brown flowers just don't add enough to it for my tastes. But if the bottle were my only complaint, that would be okay. I'm also not sure what to think of the scent. This perfume has a plentiful spray, so the fragrance comes on with strength. And that's why I don't think I've ever actually sprayed it on myself. 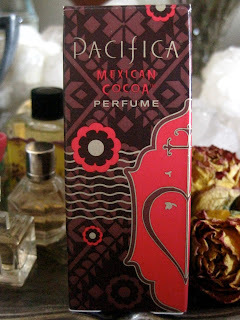 The perfume is labeled as Mexican Cocoa; I bought it because I have to investigate everything chocolate related. But the label only talks about cinnamon and clove. These are both elements of Mexican-style cocoa, especially the cinnamon--but what are they without the chocolate? When I spray this perfume, I smell the cloves foremost and then the cinnamon; but there is not really anything to remind me of chocolate. Granted, it must be difficult to get a chocolate scent that doesn't smell fabricated, cheap, and artificial. But if you can't present Mexican Cocoa as a whole, why do it halfway? I can't wear this perfume. It smells alright, so I use it sometimes as an air freshener; it's like a candle in that way, I suppose. But given that I don't wear it and don't love the way it looks on my perfume dish (an old silver tray), it just wasn't what I was expecting or wanting.